Released in 2009 and acquired by PayPal in 2013, Venmo is a true 21st-century product that has transformed the way we handle money and payments. Users of Venmo are able to transfer money between one another using the mobile payment app or the web interface. According to Recode, the mobile payment service handled $7.5 billion in transactions in 2015, and almost $3.2 billion in just the first quarter of 2016. In a recent poll commissioned by LendEDU, we found that 68 percent of respondents who use a mobile payment application use Venmo. In fact, more respondents used Venmo than Square Cash, a bank’s mobile payment app, and other similar services combined! Last year, we had conducted a study that analyzed over 500,000 Venmo transactions to see what Venmo was being used for. In short, beer, pizza, and fantasy football were amongst the most popular terms used on the mobile payment application. LendEDU was intrigued by this idea of payments for taboo items being made over Venmo, so we ran a poll! We commissioned an online survey of over 1,000 millennials to find out how many of them were using Venmo for drugs or gambling. 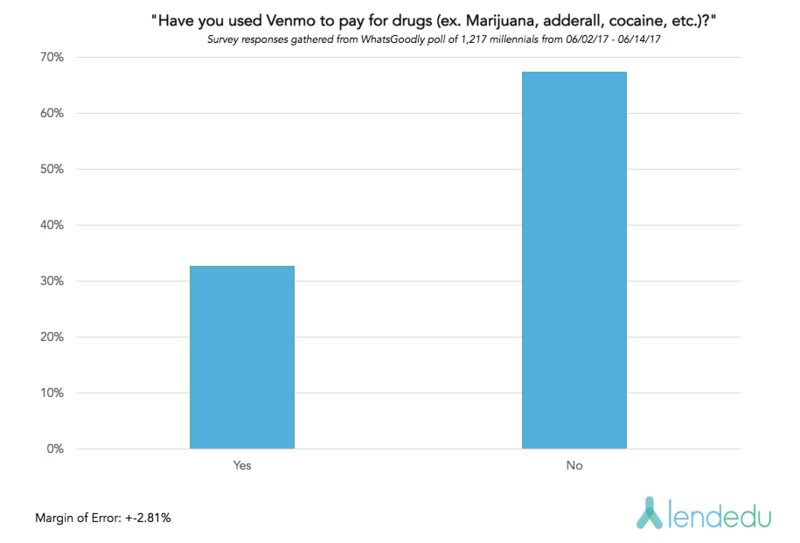 Nearly a third of respondents, 32.6 percent, claimed that they have used Venmo for some type of drug. Meanwhile, 67.4 percent of millennials stated that they have never used the app to pay for narcotics. As it turns out, less millennials, 21 percent, use Venmo for gambling than those that use it for drugs. 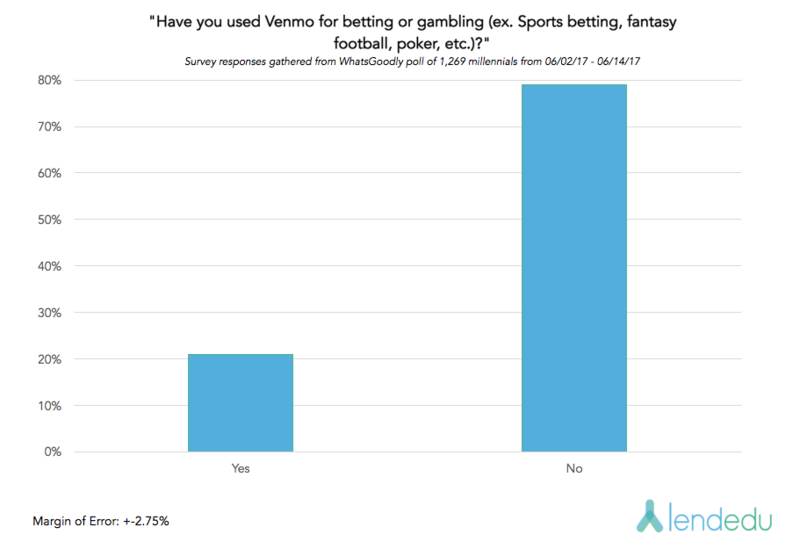 Additionally, 79 percent of respondents claimed that they have never used Venmo for sports betting. One thing is for certain: Venmo has become a medium to make shady transactions, and a sizable portion of millennials are using it for exactly that. It would seem a near impossible task for engineers at Venmo to be able to monitor daily transactions and flag payments that look suspicious. That mission becomes even more overwhelming when you consider that Venmo is on track to process $20 billion in payments per year. One interesting point is that any and all transactions made on Venmo will be on file, similar to a payment made with a credit card. Those who use Venmo for suspect transactions run the risk of leaving behind a paper trail that could come back to haunt them.